I am so incredibly sad Village is discontinuing their Kitchen candle line. Yep… totally bummed. I loved this line and Chocolate Raspberry was really delicious so I’m reviewing it anyway. May as well since you can still purchase this fragrance in various stores. I’m still finding it in my local grocery store so I bet you will too if you search for it. I’m 100% going back to my grocery store to purchase a few more before they’re gone. I love this fragrance and I’m not really a fan of chocolate scents. They always smell fake or synthetic to me… this one… YUM!! Smelling the wax, it smelled like sweet and ripe raspberries with subtle hints of chocolate. It’s perfect!! I can even smell the boysenberry glace… and it’s awesome!! I lit this candle in a large bedroom and it took 30 minutes or more before I really started noticing the fragrance and it was really yummy… boysenberry, raspberry and chocolate all blended to perfection. The only negative… it was pretty lightly scented so I ended up moving it to a medium size room… and then to a smaller bathroom where it performed much better. Once I moved it, the scent traveled all through the room and I was in chocolate raspberry heaven. Strength – on a scale of 1 to 10, I would rate this candle a 4 in a large room. 6 in a medium and 9/10 in a small room. This fragrance is definitely better suited in a small room. My candle burned perfect. Zero issues. I just had to stay on top of keeping both wicks trimmed which is normal for any candle. It burned clean and even from beginning to end. I really loved this fragrance and plan on purchasing more. I really hope Village brings this one back in their classic round jars. It’s a yummy scent. Just keep in mind it’s on the lighter side so stick to small rooms to burn it in and you’ll be in raspberry/Chocolate heaven. 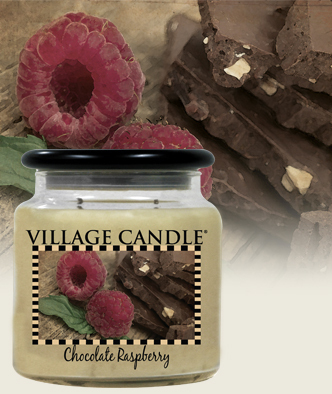 Have you tried Chocolate Raspberry from Village Candle? Review it with us. In the comment section below, review and star rate your experience… it’s easy! Scent description for Chocolate Raspberry - A new way to indulge in the sensorial decadence of chocolate. Indulge your senses with silky smooth chocolate aromas blended with fresh golden raspberries with a touch of brown sugar, boysenberry glace and just a hint of warm vanilla-sure to satisfy even the most discriminating chocolate lover.